the office crew. We reserve the right to refuse service to anyone! WE NOW ACCEPT CREDIT/DEBIT CARDS! A 3.5% FEE IS CHARGED ON ALL TRANSACTIONS! As more auctions are scheduled, this web page will be updated regularly. Please check back for more auctions! 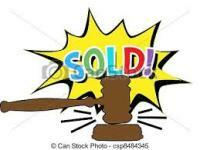 Thank you for letting Arner Auction service all your auction needs!